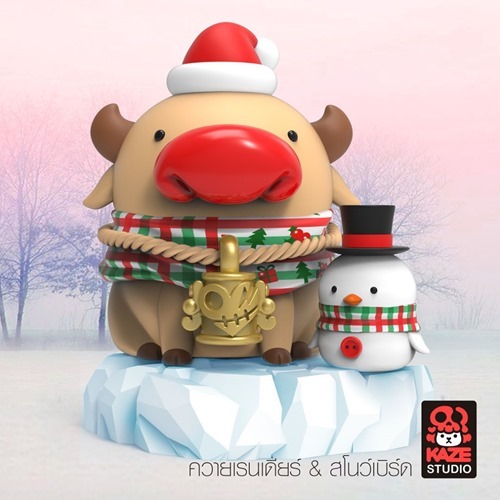 Kaze Studio (Thailand) is taking pre-orders for a festive version of their signature Buff figure. Decked out in a Santa Hat and Christmas-y scarf, Reindeer Buff has made the jump from water buffalo to sleigh puller quite nicely with added antlers and a rather red nose. This special holiday version is available in several packages. Individual Reindeer Buff (#1) figures are available for $80. There are also two sets available, one with the Snow Bird (#2, $110) and one with Reindeer Buff, Snow Bird and iceberg base (#3, $136). Order is via the comment section on the studio’s IG sale post — indicate which of the three options you are ordering. The studio will contact you directly to arrange payment. All prices include shipping. Please note that while these are Christmas themed, they will not ship until the end of January.